I'm growing these for the 1st time this year from seeds I got from White Hot Peppers. These are the best tasting ghosts ever. No floral at all for me. Yummy! But yes, Peach Bhut WM is an awesome variety. The stink bugs like them as well. Lol. Here are some of mine from last year. I'm growing it again this year, but I can't find any pics. Edited by Bhuter, 05 October 2018 - 10:45 PM. These landed in a shady spot in my garden and haven't pumped out many pods. I should have laid the garden out better. 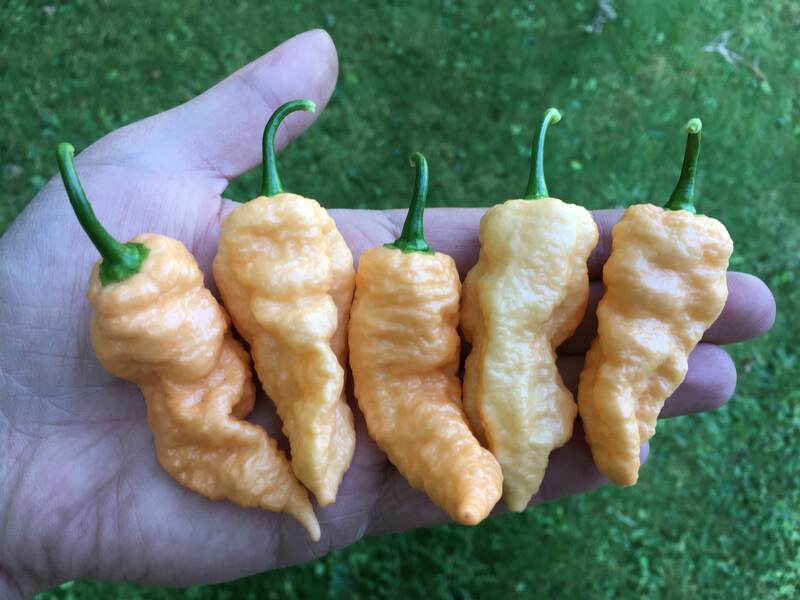 Im also growing jays peach ghost scorpions and they taste very similar to me. They are both just awesome! I grew them both last year and I consider them two totally different plants, flavors, & burns. I'm kinda growing them both again this year. I have a California Reaper that resembles JPGS in just about every way (haven't eaten the Cali reaper), but even the leaf/stem structure is the same. Anyway, Peach Bhut WM are fruity and delicious with no floral and the plant grows like a Bhut. Whereas JPGS is more floral to me, but still good, and the plant has a longer stem on the leaves. IME, JPGS and Peach Bhut WM plants grow a little bit differently. But it could just be me. 樂 lol. I guess I've grown out only 4 JPGS plants... Would've been five, but the one grew from JPGS seed (whp) came up with little red UFO shaped pods.... But, like the JPGS plants i have grown, it had the wavy leaves, long stems, and aggressively big and branchy growth pattern that i like do much. And yeah, plenty of pods, too. I really do think JPGS taste pretty good but i mostly love the plants, tbh. So I'm stoked to try to WM peach bhuts, just to see if they taste better. I'll still probably grow some JPGS every year forever... But u already like to try new stuff.